I am now safely home from my quick trip to Italy. I had hoped to blog while there, but lack of access to free wi-fi at the beginning of the trip and exhaustion made it difficult to follow through with my good intentions. We had one less day in Italy than we had hoped for due to a flight delay in the take off of our first leg, a missed connection, and an unplanned overnight in Boston. So rather than arriving in Milan on Sunday, June 12th, we arrived on Monday, June 13th. The trick with adjusting to such dramatic shifts in time zones is to try to adjust to your new surroundings as quickly as possible. So while we had lousy sleep on the airplanes on our way to Italy, my husband and I forced ourselves to stay awake as long as possible on the Monday so we could wake up Tuesday morning and have our body clocks "reset" to Italian daytime. Our first order of business after checking into our hotel was to find someplace to eat. Scott had looked in a guidebook for suggestions and copied down the address. I had purchased a good street map of Milan before we left and felt it was a wise investment. The Metro system in Milan is easy to navigate once you understand its structure. There are a few colored lines with transfer stations and you look for the name of the end station to determine which direction you need to travel. We were able to use the automated vending machines to purchase metro passes with unlimited travel for three days for only five and a half Euro a piece. I thought it was a great deal especially considering how often we used the Metro over our short stay in Milan. We found the small Caffe Verdi that had moved into the location of the restaurant whose address Scott faithfully copied down. It was a small restaurant near the Teatro Alla Scala opera house. We shared a mixed green salad with parma ham and a pizza with parma ham. Mmmmm, it was a great choice. The flavors were incredible and as we sat and decompressed, we began planning what we wanted to see in the area before we collapsed. 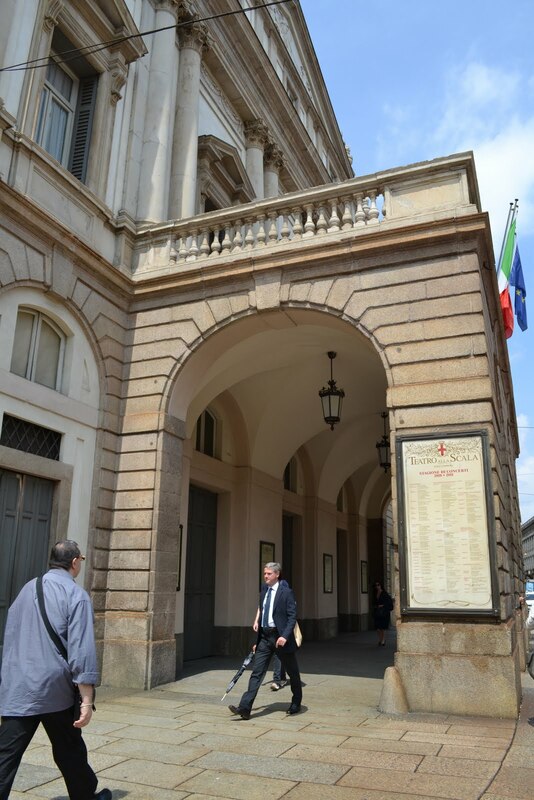 One of the places I had put on my "must see" list was the museum associated with the Teatro Alla Scala. It is one of the most famous opera houses in the world and since Orlando furioso had inspired many operas, I wanted to go there. We discovered that no photography was allowed and had to check our camera bag at the door. I would have loved to have taken some pictures of the ornate opera house and some of the costumes on display. Not only are you able to see the objects on display in the museum, but visitors can peak inside the gallery itself. We were fortunate to see the stage being set with different theatrical lighting applied and tested. After the self-guided tour we were ushered into the gift shop on our way out. There were plenty of souvenirs about the opera house itself and some notable operas had their own separate listings on bags, coasters, umbrellas, etc. Try as I might, I could not find anything with Orlando furioso. I asked about this, hoping that I was overlooking the location of these items, but was told that it was not a popular enough opera to warrant having souvenirs. Scott meanwhile was checking out a statue of Leonardo across the street. 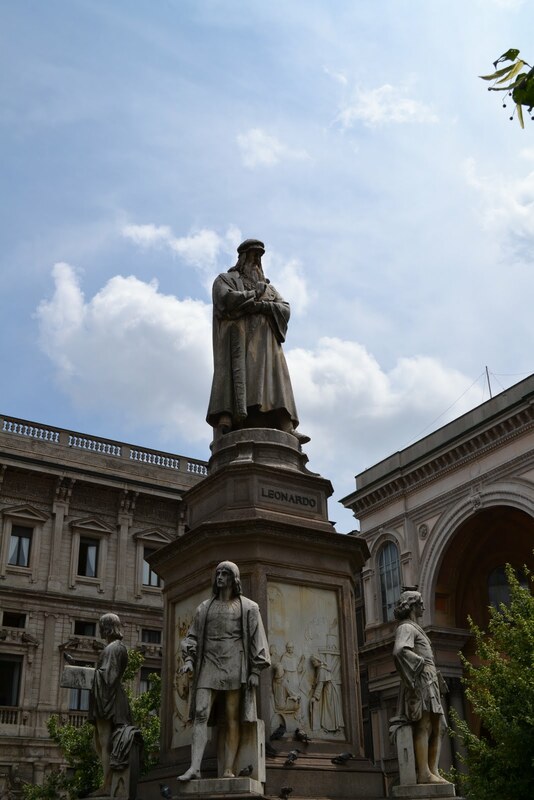 Leonardo spent several years in Milan and has an entire museum dedicated to him. The mural painting of Leonardo's famous "The Last Supper" is in Milan's Santa Maria delle Grazie church. Reservations are mandatory in order to see that famous fresco and alas, once we had confirmation of our trip it we were too late to get a reservation to see it on the days we would be in Milan. More on Leonardo in another post. 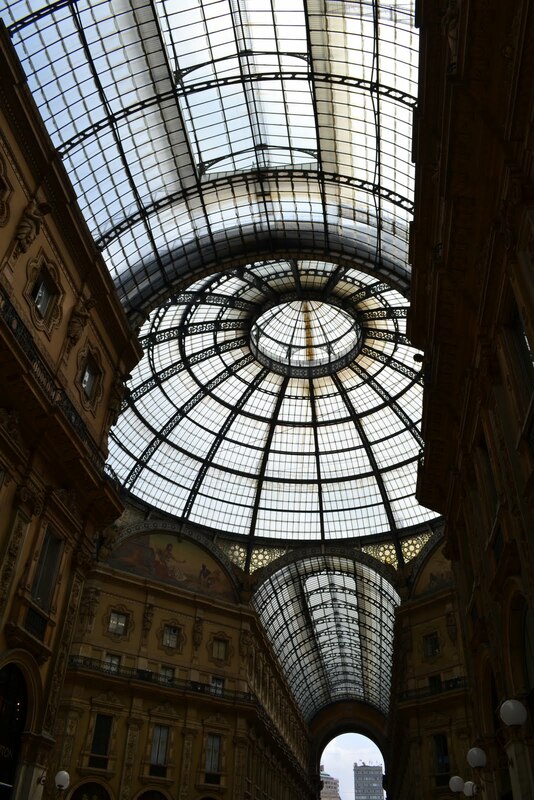 We then set out for the Duomo, and walked through an enclosed shopping gallery, the Gallerie Vittorio Emanuele II. The gallery is named after the first king of unified Italy who reigned 150 years ago. All over Italy, they are celebrating their sesquicentennial as a nation with their nation's flag flying everywhere. It is hard for me to believe that the United States is "older" than the modern country of Italy whose history dates back thousands of years, but until 150 years ago the Italian peninsula was divided into separate kingdoms. Vittorio Emanuele II unified Italy. Milan is known for its high fashion and it is readily apparent from window shopping and recognizing various designer names such as Gucci, Dolce and Gabbana, and Prada. Frankly, I preferred the people watching over contemplating buying high fashion direct from the source. I love mosaics and wanted to share with you two different mosaics from the center courtyard of the mall. Here is the symbol of Rome of the she-wolf who suckled Romulus and Remus with the slogan of S.P.Q.R. Senatus Populus Que Republicus. The other mosaic is of a bull who is the symbol of Milan. There is a local bit of folklore that it is good luck for you to step on the bull's testicles, better luck if you "spin" on them. We had watched Rick Steves' PBS show on Milan and saw this local custom. In his video, and in his guidebook, the testicles are visible but there is an obvious indentation due to the strange wear pattern of the mosaic tiles. It appears that the city decided to surrender to the custom and create something more durable. There is now a cement cylinder which makes it easy to take your little spin. And yes, I did not want to pass up a chance for good luck and tried it myself. Our next stop was the Duomo. I will save that subject for another post. I haven't been to Milan in years, but I loved it. So glad you had a great trip! Thank you. I had a wonderful time in both Milan and Rome. I do need to write more blog posts about those travels as well as my more recent trip to France! Thank you for your kind comments. I subscribed to your blog as well. The best place to find "Orlando" is in Sicily. In the streets you can buy marionetes of Orlando, Rinaldo, Angelica and Bradamante. In the north they haven't much time for their legends. In Reggio di Calabria you can find the "Fata Morgana" mentioned in Orlando Innamoratto. Thank you for your comment. I apologize for not approving it earlier. It was buried in a large amount of anonymous spam messages with links to all kinds of get-rich quick schemes. I do wish that I could visit Sicily, but have not had the chance to do so just yet. I am returning to Italy this summer, but the logistics of the trip did not make going south to Sicily a possibility. Instead, I will be going to Ferrara and Ravenna. Ferrara was the home to both Ariosto and Boiardo and Ravenna has a beautiful basilica which inspired Charlemagne to build his cathedral in Aachen. Perhaps in 2016, I will be able to visit Sicily to celebrate the 500th anniversary of the publication of Orlando furioso with seeing some of their famous puppet theater.